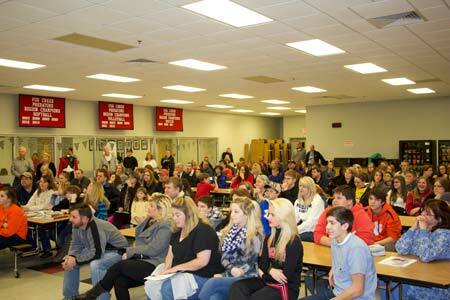 Fox Creek High School held an open house, in conjunction with report card night, the evening of Tuesday, January 21. Families in the community with current eighth grade students were encouraged to tour the school and attend an informational meeting. 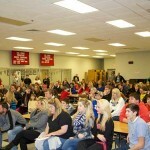 There were about 130 people in attendance, a majority of that number being prospective students. Mr. Josh Trahan, school principal, said, “I was impressed with the size of the crowd and amazed at the variety of local middle schools represented, such as Paul Knox, North Augusta Middle, Aiken Middle, LBC, and more.” Mr. Trahan began the meeting with a welcome and introduction, followed by a promotional video produced by the school and narrated by student body president Kristen Chamberlain. The video showed testimonials of current students explaining why they chose to attend Fox Creek and detailing their clubs and activities. A pamphlet was distributed containing information about Fox Creek including the curriculum, new construction, sports and clubs, awards, and the registration process for 2014-15. Current students, seniors Deondre Baskett and Kristen Chamberlain, and freshmen Daly Jernigan and Chandler Thacker, spoke about their own personal experiences at Fox Creek. 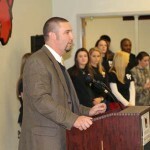 Administrator and guidance counselor, Mr. Ian Bramhall commented, “We are anxious to welcome new students and parents to Fox Creek and are happy to showcase our current students as well as the many opportunities available here.” Athletic Director Russell Schneider highlighted the numerous sports available to Fox Creek students. Future construction and architectural drawings were discussed. As the meeting adjourned, families toured the school, visited classrooms and spoke to teachers. Potential students who were unable to attend the open house and are interested in learning about Fox Creek may contact the school to schedule a meeting. Contact information and registration packets can be found at www.foxcreekhighschool.org.